The former Scotland international has been placed in temporary charge of Selkirk FC following the dismissal of Steve Forrest. 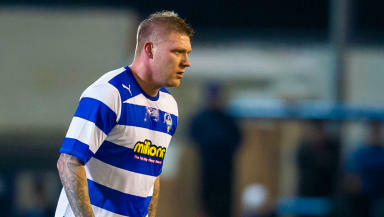 Former Scotland international Garry O'Connor has been named as caretaker manager of Selkirk FC and will be in the dugout for their next Lowland League match. The striker has been placed in temporary charge of the team following the dismissal of Steve Forrest from his position on Wednesday. O'Connor, aged 32, counts Hibernian, Lokomotiv Moskow, Birmingham City and Greenock Morton among his former clubs and has been a player at Selkirk since August 2014. The striker, who won 16 caps between 2002 and 2009, will now look to lift a team which finds itself seventh in the Lowland League ahead of this weekend's match against Gretna 2008. In a club statement, Selkirk said: " Selkirk FC would like to confirm that Steve Forrest has been dismissed as Manager of Selkirk FC from immediate effect ; the club would like to wish Steve all the best for the future and thank him for all his hard work over the last two seasons." O'Connor's appointment as caretaker manager was later confirmed on the club's Twitter account.